European fascists and neo-Nazis have been pouring into Syria to fight alongside the Syrian regime forces, which are also supported by Sepah Qods and Hezbollah Lebanon fighters. Where does that leave the latter two, who are supposedly the ‘defenders of Islam and Palestine’ against ‘Western imperialism’ and ‘European racism’ advocated by fascists? – the National Rebirth of Poland, Falanga and All Polish Youth in Poland. Naame Shaam has learnt that Ukrainian and other Eastern European neo-Nazi groups have also been supporting the Syrian regime in various ways, mostly symbolic, but we have not been able to obtain further details yet. Last year a Greek fascist from a group calling itself Black Lilly (Mavros Krinos) revealed in an interview  that the little-known group had fighters on the ground in Syria (allegedly the size of a military platoon) and had fought alongside Hezbollah and Assad forces in the infamous battles of Qusayr, near Homs, in Spring 2013. He also claimed that “thousands of Russians, Ukrainians and Poles” from fascist groups have “declared themselves ready to fight… alongside our Syrian brothers in arms… and the lion of Syria,” meaning Bashar al-Assad. Asked whether they had participated in any other “struggles” before, such as Kosovo, Iraq or Afghanistan, the Black Lilly spokesperson answered no. Other European fascist groups have travelled to Syria “in solidarity” with the regime and on so-called “fact-finding missions.” Many of these groups are members of the European Solidarity Front, which has organised a number of these “visits” in 2013. In June 2013, a delegation of European far-right politicians travelled on an officially sponsored visit to Damascus. Nick Griffin, the leader of the British National Party (BNP), was among them. His “findings” were that, apart from “occasional explosions,” life in Damascus was “normal.” Griffin also praised Hezbollah Lebanon for its role in supporting the Syrian regime. Hezbollah’s leader Hasan Nasrallah and his masters in Tehran would have certainly been flattered by such praise. 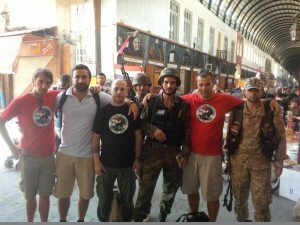 Polish fascists from Falanga travelled to Syria, also in June 2013, on a “solidarity mission” and met with the Syrian prime minister and deputy foreign minister in Damascus. In Beirut, Lebanon, they met with representatives from the Syrian Social Nationalist Party, whose members have been fighting alongside the Syrian regime forces and Hezbollah Lebanon, both in Syria and in Lebanon. – Twisted concerns about growing Arab and Muslim migration to Europe, where fascists in a number of countries have been protesting against and harassed Syrian refugees. To these we may add another factor. These fascist groups seem to share the same mentality and value system with the Syrian regime, Sepah Pasdaran and Hezbollah Lebanon. They all believe in their supremacy, which is often based on racist mythologies, and are ready to eliminate, by any means possible, those they regard as inferior to them. For example, most European fascist and neo-Nazi groups call for re-introducing corporal and capital punishment, abolishing anti-discrimination laws and deporting all migrants. The Iranian regime and its offshoots, like Hezbollah Lebanon, believe in and practise similar things, even though their victims and targets are different (Arabs, Kurds, Sunnis, women, political dissidents, etc.). Moreover, like those fascist groups, they believe in extreme violence and are ready to use it to achieve their aims. So it is not that surprising, perhaps, that both would be fighting on the same side against a popular revolution demanding dignity, freedom and social justice. http://glykosymoritis.blogspot.ro/2013/09/syria-greek-nationalist-socialists-that.html. The original interview in Greek can be found at http://tinyurl.com/lffdhrx.